Have you ever thought about an invention that maybe YOU can't make, but it sure would be nice if someone else did? Yep, this is exactly what it looks like. Two slabs of highly polished solid maple hinged together. Two insets dug out of the top to store a notebook and writing utensils. I doubt I'd use something like this, but I would have killed for it in high school, when writing poetry and short stories was an act of rebellion. The heavy bottom slab is a great board for any purpose. You can't gut a fish on an electric laptop! The insets are lined with the same high quality green felt used to cover pool tables. Bottom-heavy so the thing doesn't tip over. Elastic straps to keep your stuff in. The only thing spilling out of this laptop are your ideas! 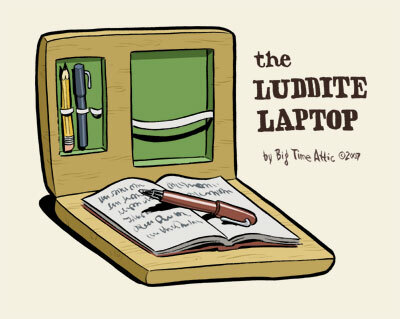 Unlike the MacBook Pro, the Luddite Laptop won't burn your thighs .. unless it catches on fire! Like Dell laptops, the Luddite Laptop can easily catch on fire. So, you want to invent it? Already know about something just like it? Got a reason why it would never work? Got some suggestions? Got your own "I Wish Someone Would Invent..."? See you in the comments! I bet you a nickle that this thing would sell pretty well, too. Patent it and make a cool million. Yeah, I could see it selling for a lot of money at Brookstone at the airport. It'd be on the shelf right next to the $35 neck cushion. Danno, does a clipboard have ... green felt lining??? The felt lining really makes the idea work. I was in a Barnes and Noble right before christmas and over heard a lady talking to one of the staff. Seems she wanted this lap desk that they sell it is nothing more then a board covered in felt with a pillow attached to the bottom of it to sit in your lap. I heard the staff member tell her that they only had one left that they were a real hot seller for the. Not exactly the same, but perhaps similar enough?